The Chuck Cowdery Blog: Double Your Pleasure. It's not a great picture, nor is it a very attractive thing. What is it? Something you rarely see, yet it separates fine bourbon whiskey from mere alcohol. It is a doubler. Specifically, the doubler at Maker's Mark. Although not required by law, most bourbon whiskey is double-distilled. The first distillation takes place in a column still. When you visit a distillery in Kentucky and they show you the still, that's what they show you. It looks like a column. They're typically five feet in diameter and two stories high. Every couple of feet there is a porthole-like thing. That's where the first distillation occurs. When the distillate leaves that still it goes to the one pictured here, the doubler. 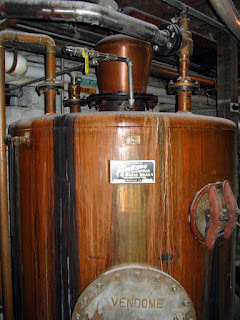 A doubler is a type of pot still. There are two types of doublers. One is the conventional doubler, the other is the thumper. For a conventional doubler, the distillate is condensed into a liquid before it enters the doubler. For a thumper, it's introduced while still a vapor, and the introduction of hot vapor causes a thumping sound, like when a cold radiator pipe gets hot. Distillers say the purpose of the doubler is to polish the spirit. It's all about flavor. Certain congeners just can't be gotten at any other way. As bad as that picture is, most doublers look worse. Most don't have copper on the outside. Most look about the same as any of the other tanks that are everywhere in a distillery. Back when the American whiskey industry was crashing in the 1970s, many producers joined in a race to the bottom and some stopped doubling to cut costs. Eventually, they all resumed the practice. As the distillers say, you can make alcohol without doubling, no problem, but you can't make fine bourbon whiskey. We're only talking about the major bourbon and Tennessee Whiskey distilleries here. Micro-distilleries do their own thing and many do not feel double-distillation is necessary. When I'm in a distillery, and think of it, I usually ask to see the doubler. That's what happened when this picture was taken about two years ago. It's usually in the basement, so there is stair climbing involved. I've never been shown one routinely on a tour. A few years ago I was at Jack Daniel's and there was a rumor going around that Jack Daniel's doesn't double. I asked the then Master Distiller Jimmy Bedford that question while we were on the tour. He said yes so I asked to see it. I should say 'them.' Jack Daniel's has five column stills, and five doublers. Its like how there are wash stills and spirit stills for two stage distillation in pot still operations - i.e. how Scotch is made. In Scottish distilleries the slightly smaller spirit stills are usually on prominent display. Awesome post, Chuck. You continually educate, inform, and delight. The doubler at Four Roses was fairly prominent, and pointed out to us by the guide. That was the only one I can think of ever seeing, however. Another way Four Roses is unique. Odd. I've toured BT several times and never seen it. Have to ask next time. Flavored Whiskey Leads Spirits Growth. Come See Me In Frankfort This Coming Saturday. The Mint Julep, An Appreciation. My Friend The Titanic Survivor. Weller Antique Is Not Being Discontinued. The Deconsolidation Of Irish Whiskey Continues. Upcoming Whiskey Classes In Chicago.